Friday Night Fights: "The War!" - Prize Fight: All Those Wonderful Toys! It's come down to this: Friday Night Fights: "The War!" Our host, Spacebooger has given us one rule for tonight's special round: That the fight feature a lot of collateral damage. Tonight's battle royale comes from Fantastic Four#580 by Jonathan Hickman, Neil Edwards, and Andrew Currie. 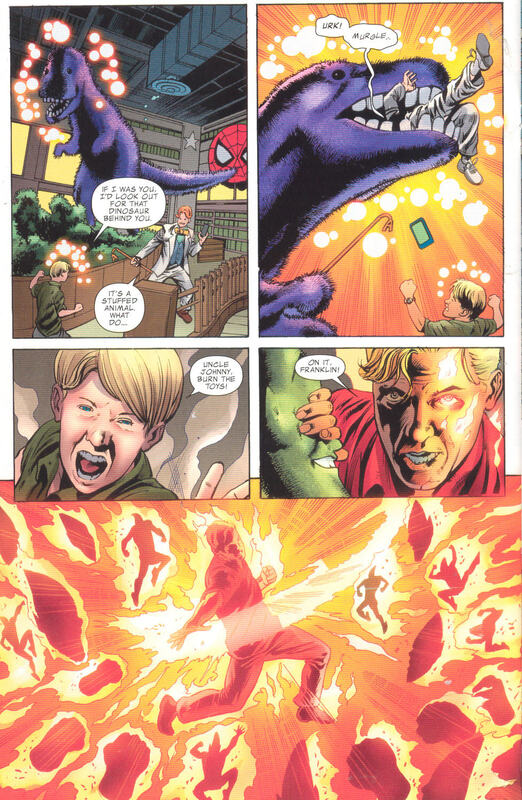 The setup: Johnny Storm is taking his nephew Franklin Richards and Franklin's pal Leech to a toy store, where he finds old FF ally The Impossible Man unveiling his new toy line, including action figures, plushees and "Impossible Fists". Unfortunately, the toy store he's partnered up with is run by old X-Men nemesis Arcade, who claims he's reformed. In the words of Jerry Seinfeld: Oh, THIS will end well. 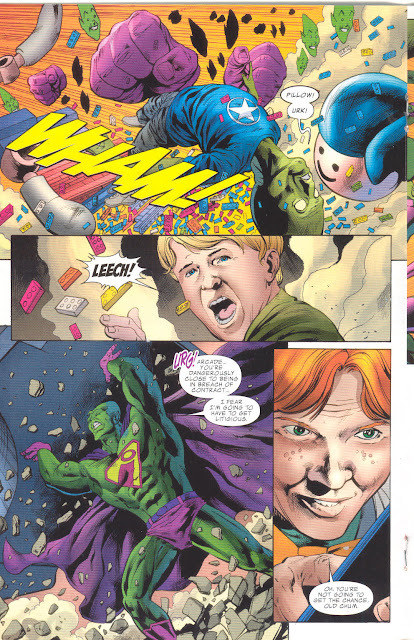 ....and Arcade's about to learn why you do not want to make the kid with the reality-altering powers ANGRY. All that's left is our friendly neighborhood Impossible Man's reaction to all this carnage. Tonight's fight music for this special round is by none other than Aerosmith. For more Poppupian pugilism, click here.﻿ And don't forget to vote! 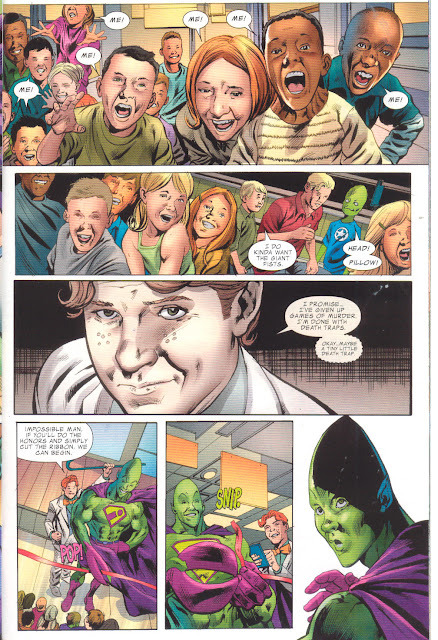 Friday Night Fights: Marvelous - Round 12: Gail Simone's Revenge, Part Deux! Back in Round 7 of Friday Night Fights: Marvelous, I posted an entry titled﻿ "Gail Simone's Revenge", in which I detailed Gail's creative revenge for the way DC had Deathstroke needlessly kill of Ryan "The Atom" Choi in 2010. You can read the details, along with my fight entry, here. So Gail got her revenge on Deathstroke, albeit an alternate Elseworlds version. But what about the man who hired him to kill Ryan, Sylbert "Dwarfstar" Rundine? Dont worry, folks. Dwarfstar also gets his (in real continuity, no less), as you'll see in tonight's fight. 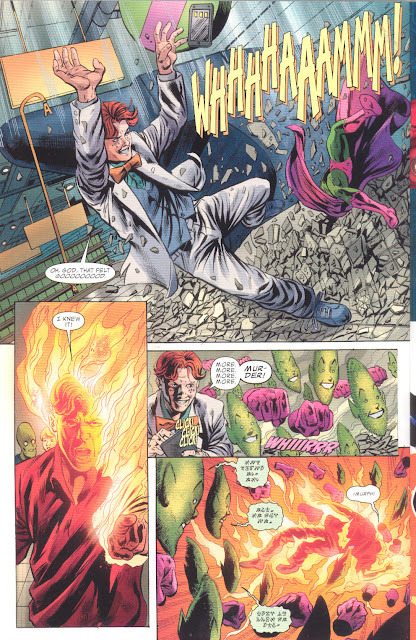 This follow-up display of Simonean Schadenfraude comes from Secret Six#28, illustrated by J. Califiore. Synopsis: After an earlier schism splits the team, Bane hires some additional villains for the Six. One of them is the aforementioned Dwarfstar. Unfortunately for him, another new recruit is Dr. Doris Zeul. Also known as Giganta. Also known by fans of Gail's Atom book as Ryan Choi's former girlfriend. At first, Doris doesn't know Dwarfstar's role in Ryan's death. Until a little bird named Amanda Waller tells her. Cut to Dwarfstar's quarters, where he finds himself greeted by a very special visitor. Don't worry, folks. He survives this, albeit in traction. Tonight's fight music comes from The Tubes. For more comic payback, click here. And don't forget to vote! Please don't read my Batgirl#1 review, Gail. PLEASE DON'T READ MY BATGIRL#1 REVIEW!!!!!!!! Friday Night Fights: Marvelous - Round 11: Violet Gets Violent! 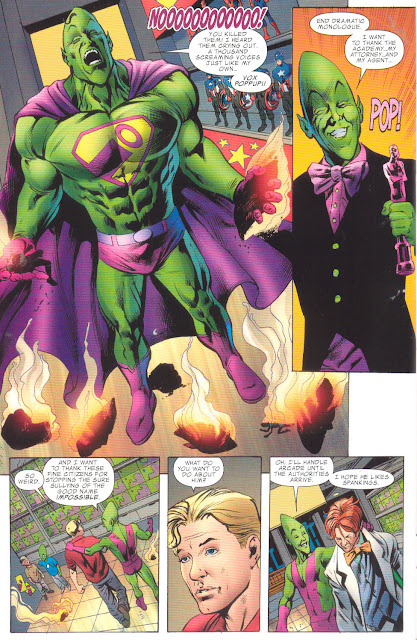 Since I won last week's Friday Night Fights: Marvelous round with Iron Man vs. Dwight D. Eisenhower last week, tonight's entry is going to be a Legion of Super-Heroes fight. 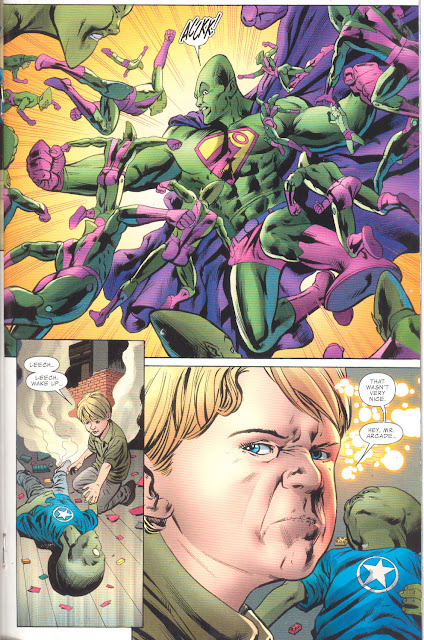 Since my last Legion fight focused on Colossal Boy, I thought I'd go to the other size extreme tonight by spotlighting Salu Digby aka Shrinking Violet. Tonight's scaled-down smackdown is from Legion of Super-Heroes#66, written by Tom McCraw and Mark Waid and illustrated by Lee Moder and Ron Boyd. This story takes place a few issues after Zero Hour, which triggered the first of many Legion reboots. Synopsis: It's Legion Membership Drive Time! Some Legionnaires go to Imsk to recruit a new member from their world. Three Imskians, including Shrinking Violet, compete for the Legion membership. In the course of the competition, another Imskian competitor, Ion (no relation to Kyle Rayner), is mysteriously killed. In the course of the Legion's inveestigation, they and Violet determine that the third competitor, Micro, is the killer. Violet and the Legionnaires expose Micro and his crime to the other Imskians, at which Micro attempts to escape by shrinking out of sight. But while this tactic works well enough against Phantom Girl and Lightning Lass (aka Spark here), it's much less effective when you're on an entire planet full of beings who can do the exact same thing, especially when one of them is the aforementioned Violet. Tonight's fight music is by Hole. For more molecule-sized melees, click here. And don't forget to vote!